Wow! Television's Silver Fox of Fashion, Tim Gunn keeps it on the low-maintenance side when it comes go his grooming routine. 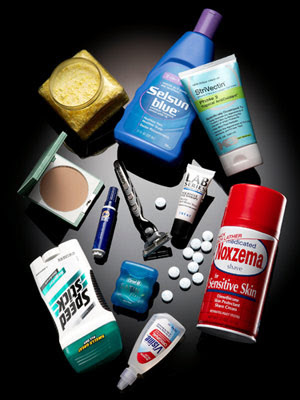 Marie Claire, the FAB women's magazine, lets us in on the Silver Fox's grooming products. Sounds like a solid Duane Reade shopper with an occasional visit to Sephora. Check it out. 1. L'Occitane Citrus Verbena Fizzy Bath Salts, $22: "I buy these in bulk because they never leave a ring in the bathtub—I'm a neat freak!" 3. StriVectin Phase 2 Topical Antioxidant, $109: "I'm the oldest acne-prone person you'll ever see." 4. Clinique Almost Powder Makeup, $22.50: "Project Runway's director of photography suggested I start using powder. I use this to get rid of the glazed-doughnut look." 5. Tide To Go Mini pen, $2.99: "This has saved me from many embarrassing moments. I also travel with my trusty Tide Total Care detergent to ensure my socks don't fade or pill." 6. Gillette Mach 3 Turbo Razor, $8.99: "Shaving with this razor is like getting dermabrasion—in a good way." 7. Lab Series Age Rescue Eye Therapy, $26: "A Lab Series rep at Bloomingdale's recently told me she could really help me if I started a regimen immediately. I told her, 'Well, I've been using your products for 10 years. Imagine what I'd look like without them.'" 9. Oral-B Satin Floss, $2.99: "Fresh breath and a clean mouth are right up there with being well groomed." 10. Ice Breakers Sugar Free Mints, $1.99: "I'm never without a mint. There's no excuse for coffee or tuna breath." 12. Noxzema Shave Cream for Sensitive Skin, $4.49: "I like to surprise my skin, so I alternate between this and a Lab Series shaving cream."